The Homeless Itinerant Bathing Society (Edinburgh Branch) will this week, be visiting the recently refurbished Glenogle Baths in Stockbridge, which according to Edinburgh Leisure's website is "something of a rare breed - a hark back to Victorian baths, but with a modern twist." Glenogle was the subject of a well supported community campaign, which put pressure on the Council to refurbish the baths as originally promised. Whilst it came out that plans were being mooted the the pool could be 'redeveloped', the energy and commitment of the campaigners ensured that the baths were kept as a public amenity. 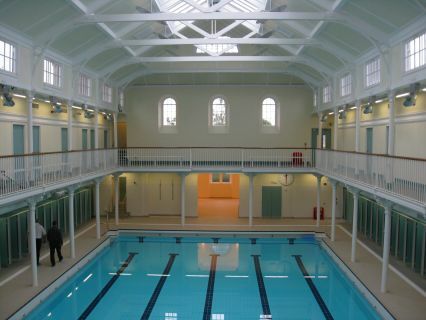 Following a £5.7 million refurbishment, the pool re-opened in July 2010.